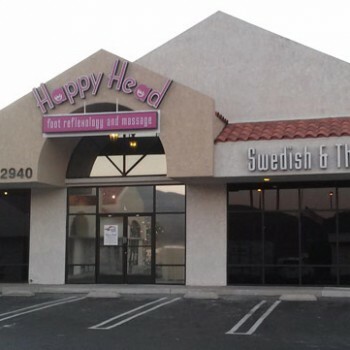 Happy Head Massage has opened it’s newest and largest massage establishment in Rancho San Diego. This is their fifth location in San Diego, and they have their eyes on expanding to several more throughout Southern California. The Happy Head has set the new standard for massage therapy. With their mission of always providing a great massage without the spa prices, they have become the premier location for massage therapy. In a very short time what started off as a silly idea has become what many are calling the best place to get a massage. The new Happy Head Massage will open September 15, 2014. For the latest Happy Head news at the new location, visit their news page at www.happyheadmassage.com/news/. With almost 5000 square feet of space and over 30 massage beds, this massage establishment is setting the standard in exceptional massage therapy. Even though Happy Head Massage is known for exceptional services and upscale Zen like decor, their prices are affordable for most. With prices starting at only $35 for a one-hour Asian Style foot reflexology and body massage, they have made regular massage therapy accessible for many. With a name like Happy Head and thousands of reviews across the internet from raving fans, they have created quite a buzz in the massage therapy world. What once was considered a luxury for many, Happy Head Massage has changed it from a luxury item to an affordable experience. A one-hour full body Swedish or deep tissue massage only costs $55 and a one-hour Asian style massage only costs $35. By streamlining the process, eliminating unnecessary frills, and hiring experienced massage therapists that get it right the first time, they have been able to maintain a great experience for their customers while keeping the costs low. Joe, a customer at Happy Head says “For a fraction of the cost of what I pay at other spas, the Happy Head offers a much better service and a much better price. I won’t go anywhere else, and they definitely get my 5 star review on Yelp.” Happy Head Massage plans to continue more expansions throughout San Diego and beyond. Lynn, a manager at Happy Head says, “Our success is driven by our customers. Unlike other massage establishments that try to push their agenda on to customers, we give customer exactly what they want. We never require memberships or contracts, we provide a clean and upscale decor, and we always provide a great massage with affordable prices. As long as customers keep loving us, we’ll keep expanding.” The Happy Head also offers many other significant advantages that has placed them ahead of the competition. They are open 7 days a week from 10am till 9pm. Walk-ins are always welcome. They have multiple locations for customer convenience. The massage establishments are clean and professional. And they always offer affordable prices. For those customers looking for even better massage deals on top of the already discounted prices, Happy Head Massage offers their list subscribers regular discounts and deals. Some of these massage deals include free birthday massages, regular drawings for free massages for a year, and daily deals through Facebook and the loyalty app. Customers can sign up for the Happy Head mailing list at www.happyheadmassage.com/join-our-mailing-list to enjoy some of their latest massage coupons and offers in San Diego. So keep your eyes open for the next Happy Head massage opening mid-september in El Cajon. Before you know it, everyone will be able to get a great massage without the spa prices thanks to Happy Head Foot Reflexology and Massage.